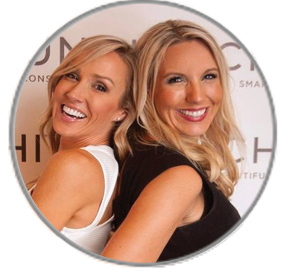 Melanie and Kelly are two powerhouse women entrepreneurs who teamed up in 2016 to launch Crunchi, a revolutionary cosmetics collection that is raising the bar in beauty. These women are dedicated to educating consumers about potential harmful toxins in cosmetics, and offer a non-toxic alternative that doesn’t sacrifice health for performance. In a short time, Crunchi has taken the clean cosmetics world by storm. Frustrated and alarmed by the number of hazardous ingredients in so many products today, and unable to find safer options that met their standard of quality and performance, they teamed up to develop Crunchi. Melanie is a board certified family nurse practitioner. Kelly is a business and sales professional. And they have both always been passionate about living a healthy lifestyle. Both believe women deserve quality products that perform, without comprising their health. They are advocates of reducing the cumulative toxic burden that many cosmetics provide, to enhance disease prevention and promote healthier living. © 2019 Good Life Gals.